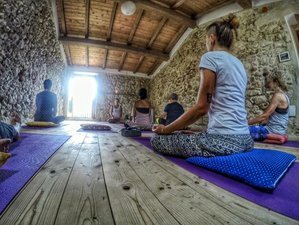 Italy Farm Stay invites you to join in on this unique authentic farm life yoga and meditation retreat held in the beautiful Italian countryside. You can relax in a peaceful tranquility, eat fresh fruit from the trees, ramble around in the beautiful forests, take part in rejuvenating yoga classes and walking meditation, enjoy a wide range of extra activities, immerse in Italian culture, and enjoy delicious homemade Italian meals! During this retreat, you will be accommodated at Italy Farm Stay. You can choose from different types of rooms to fit your budget and your vacation. The rooms have been recently restored and are equipped with a fan in the summer and a heating unit in the colder months. All of the rooms are made of limestone walls, which keep them quite cool in the summer and air-conditioning is not necessary for most guests. The larger rooms can accommodate up to four or five people, while the dormitory can accommodate five people. There is a crib available for families traveling with young children. The farm itself is a large property where you can roam around, eat fresh fruit, spend time with the animals, relax in the shade of an olive tree, or hike around the trails in the beautiful forest. Camping on the farm is also available for guests who are looking for a more affordable stay but who want to enjoy the tranquility and beauty of the farm. You can bring your own tent and equipment, or you can rent a tent, sleeping bag, and sleeping mat for a small fee. The campground is in a beautiful area of the farm, close to many fruit trees and vegetables which you can pick yourself and eat for free. You will wake up each morning to a beautiful view of the mountains and the surrounding area. Yoga Farm Italy is the tranquil escape that you have been searching for! The program allows you to just simply relax, de-stress from the culture of today's busy society, or to enjoy the spiritual benefits of yoga that could prove to be a life-changing experience. By taking part in daily yoga practices, you will have the opportunity to learn about the ancient art of traditional Hatha yoga. The practices include sun salutations or flowing yoga poses, various yoga postures, relaxation, Pranayama, and meditation. Yoga classes take place daily, either in the morning or afternoon. Enjoy a meditative hike to a beautiful waterfall in the Abruzzo National Park. This includes pranayama section and the yogic technique of trataka on the sun at sunset. The whole walking meditation aims to reconnect with yourself and nature. You will visit one of the most beautiful waterfalls in the park located along a stunning gorge. Linda is a certified Usui Reiki master/teacher at Italy Farm Stay. She is also a Hatha yoga instructor, Yoga Alliance-certified, completed her teacher training course at Akasha Yoga Academy. In 2009, she left her home country, the Netherlands, to explore the world. She came across yoga and Reiki soon after and when she immersed herself into the practice of Hatha yoga and the wonderful world of Reiki, her life changed profoundly. This retreat will take place in the small village of Pescosolido, at the foot of the Abruzzi National Park. The area around the farm is one of the most beautiful places in Italy. Mountains, waterfalls, hiking trails, lakes, wildlife, and many interesting ruins, churches, and castles are easily accessible and the area is not filled with tourists like other parts of Italy. The farm is close to the town of Sora (about 35,000 inhabitants) where you can eat at local restaurants, stroll along the lively main street, visit the numerous shops, cafes, and pubs, use the internet, or go to the open air market on Thursday mornings. During this retreat, you will be served daily vegetarian and organic breakfast and dinner at the farm. Non-vegetarian dinners are also available but the staff must be notified in advance. The farm tries to be as self-sufficient as possible while creating nutritious and delectable meals for its guests. Ingredients such as vegetables, fruits, potatoes, eggs, meat, olive oil, and wine come directly from the farm. Vegetarian, vegan, gluten or dairy free meals are available upon request. Breakfast on the farm, which takes place between 8 am and 10 am, is a traditional Italian simple breakfast. It includes coffee, tea, homemade seasonal jam, bread, milk, and biscuits. Seasonal fruits and vegetables from the farm are often included in the breakfast. Dinner is a special time to sit together, will give you the opportunity to eat a traditional Italian meal full of wholesome food from a wide variety of farm products. Dinner includes two dishes which are usually pasta which is often homemade by hand that day, followed by seasonal vegetables, fresh salad, local handmade cheese, home grown potatoes, eggs from the farm, lentils, or beans. Non-vegetarian meals are available on request. Italy Farm Stay offers a dish with locally selected meat such as steak, chicken, or pork for an additional cost of three Euro. The meal is also accompanied by local bread. Homemade wine is served with the meals for an additional cost of 2,50 Euro per half a liter. You are welcome to pick and eat from the abundance of fruits that comes from the farm. It is an indescribable pleasure to eat fresh organic fruit directly from the trees. On the farm, fruit is handpicked when it is perfectly ripe so that you can enjoy the full flavor. There are a wide variety of fruits available especially in late spring, summer, and fall. Among them are figs, plums, peaches, cherries, cherries, persimmons, apples, pears, grapes, apricots, berries, and nuts. Walk along the beautiful valley of San Piedro in the Abruzzi National Park with a local guide. On the hike, you will see the surrounding mountains, walk along a gorge, and visit a beautiful waterfall where you can swim in the refreshing water. This day hike you can do on your own or with other guests staying at the farm. Free maps are provided. Hike along the mountainside to the top of a beautiful mountain and sleep among the stars. You will see beautiful views of the Abruzzi National Park, sleep in a traditional mountain hut, and cook food from the farm over an open fire. This is truly a magical experience! Price is 90 EUR for a one person, 45 EUR each for a group of two people, and 38 EUR each for three or more. Take a tour of a unique vineyard in the Valle di Comino of Atina, a small town a short drive south of the farm. This vineyard produces the Cabernet Atina Doc wine, and in the last ten years, it has gained its controlled origin denomination recognition and is increasingly becoming more appreciated both in Italy and abroad. The French Cabernet grape used to make this wine was first planted in Italy more than 150 years ago by the agronomist Pasquale Visocchi, and there is a festival every year celebrating this unique wine. You will have to the chance to visit this beautiful region. See how this special wine is made and taste for yourself how delicious it is. Learn how to make homemade pasta with fresh ingredients from the farm. This traditional Italian meal will then be part of the dinner that all the guests can enjoy. Price including vegetarian dinner is 29 EUR for one person, 24 EUR each for a group of two, 22 EUR each for groups of three and up. Learning Italian will help you get around Italy while you are traveling! Classes are offered for beginners or more advanced speakers. Spend a little bit of time learning the language of love. Price is 12 EUR for a one person, 8 EUR each for a group of two people, and 7 EUR each for three or more. Fly through the sky and touch a cloud with your finger! Float above the mountains and the surrounding area in the Cassino valley with an experienced paragliding instructor. Specific weather conditions are needed to fly. Price per person is 90 EUR. Take part in an old family tradition in the Italian countryside. The shepherds family has been making cheese and herding sheep for generations. You can watch the local shepherd and learn how to make pecorino and fresh ricotta cheese. Price is 28 EUR for a one person, 20 EUR each for a group of two people, and 15 EUR each for three or more. From Rome, take the A1 towards Naples. You will exit at Ferentino and follow the signs to Sora. From Sora, the farm is about 10 minutes away. From Naples, you will need to take the A1 towards Rome. You will exit at Cassino and follow the signs for Sora, where eventually you will exit at Sora Centro. Please book your flight to arrive at Leonardo da Vinci - Fiumicino Airport (FCO), Ciampino - G.B. Pastine International Airport (CIA), or Naples International Airport (NAP). From Rome, the easiest way to get to the farm is by bus. The ticket costs 5.50 EUR. The bus leaves frequently throughout the day, even on Sundays and holidays. To catch the bus to Sora, you must go to the Anagnina Bus Station in Rome by taking the metro line A (the metro takes about 25 minutes from the Termini station, Anagnina is the last stop on line A). The bus to Sora leaves from platform 10. The station in Sora is the last stop on the bus, so while you are on the bus, you can relax and not worry about missing your stop. From Naples, there is a bus that takes you to Sora that leaves everyday except Sundays and holidays from Piazza Garibaldi. Piazza Garibaldi is in front of the main train station in Naples. The name of the bus company is ARPA and the bus goes to Avezzano. Make sure to ask the driver to tell you when you get to the station in Sora. The bus costs 9 EUR and can be paid on the bus and the trip takes about two and a half hours. The bus leaves Naples at 2.30 p.m.
Once you arrive in Sora, Italy Farm Stay will pick you up from the station. From Rome, you need to catch the train at Rome Termini station for Roccasecca, then shift for Sora. Make sure to check the train schedule for Sora before you leave Rome, so you do not get stuck in Roccasecca. If you plan to arrive in Sora in the late afternoon, it is recommended that you take the bus instead. From Naples, you need to catch a train to Cassino or Roccasecca, and then you can either catch a bus or a train to Sora, depending on the time. Be sure to check the train schedule in Naples so you do not get stuck in Cassino or Roccasecca. From Pescara, you will need to catch a train to Avezzano (you may have to switch trains in Sulmona depending on the time schedule). From Avezzano, you can catch a train to Sora. When you arrive at Sora train station, Italy Farm Stay will pick you up. Please let them know your arrival time. Italy Farm Stay is an organic farm between Rome and Naples which offers yoga retreat packages that help you experience the authentic style of country life.